Shadow of Mordor got its first major DLC installment today, Lord of the Hunt. As the name suggests, the expansion is all about monsters—ones you can kill or bend to your will in various ways. Let's take a closer look at some of these gnarly new beasts. Before I go into further detail about the new offerings, I should clarify two important details. First, I haven't finished Lord of the Hunt yet. As a result, I'm not ready to give full impressions on the expansion yet. Secondly, I was unpleasantly surprised to discover when I booted up Shadow of Mordor on my PS4 that Lord of the Hunt doesn't actually take place inside the same world as the main game. Or at least, the same version of the world. Instead, the expansion takes place in a modified version of one of the two maps in the base Mordor game. That's disappointing, for sure. But what about all the new monsters, you ask, hypothetical Shadow of Mordor fan? Great question! Let's see what Lord of the Hunt has in store for all the aspiring rangers of Gondor out there. The first new beast that you meet in Lord of the Hunt is an angry bit of a thing known as a "caragath." They're lithe, agile alternatives to the lion-like caragors that wreaked so much havoc in my original Shadow of Mordor game. Monolith described these guys as "stealth caragors" in their original announcement, and that pretty much sums it up. They move more quickly and dextrously than caragors, and they have a short speed boost ability. But the main thing I noticed was that they allowed Talion to perform similar stealth kills to the ones he does on foot, only on top of a vicious, wild animal. Stealth in Mordor is as nonsensical as ever—maybe moreso, considering that those two guys didn't notice a vicious wild animal perched a few feet behind them. But that doesn't make pouncing on an unsuspecting foe any less satisfying. Since every bile-based projectile diminishes the monster's health slightly, the graug's barf-based attacks come at a price. I learned this the hard way during one early mission when I tried to storm an orc-infested stronghold while riding triumphantly atop a wretched graug, only to have the monster fall to his death right after I'd stepped through the front gate. Silly me. Who would've known all that vomiting was a sign of the graug's relatively frailty? Lord of the Hunt also has a few types of bait to help you better control the new beasts even when you're not riding them. Dangling hunks of meat hang around orc strongholds, offering an easy way to lure wretched graugs inside to barf on all the fortress's inhabitants. There are also clumps of earth scattered throughout the map that look sort of like large anthills, which can be used in a similar way to summon up waves of zombie-like monsters known as "ghuls." Riding on top of these new monsters today was a lot of fun. 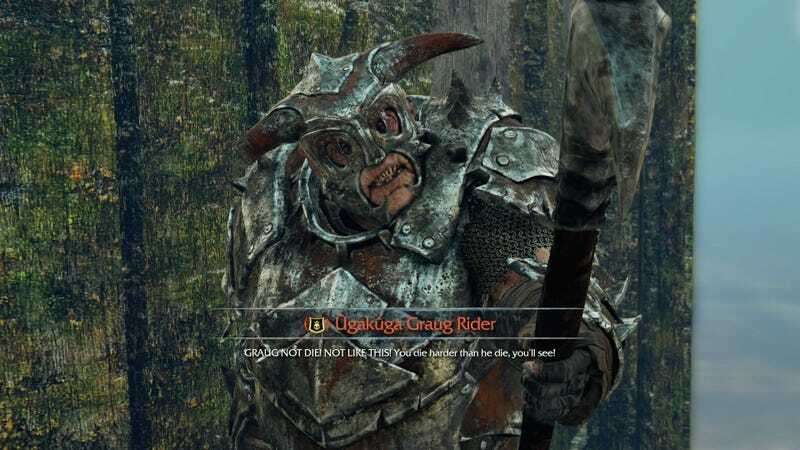 But the coolest part of Mordor's new Lord of the Hunt DLC comes when you see Talion's sworn nemeses riding them, too. I'm talking about the ranked members of Sauron's orc and uruk army, who were also the most memorable characters in the original game. He knocked me off my feet pretty quickly. Then his minions, who were also riding on top of caragaths, made short work of me. It wasn't pretty. I ultimately defeated Ashgarn. And shortly after I did, I was confronted with the most formidable challenge I've been faced with so far in Lord of the Hunt: another orc who rode into battle on top of a graug of his own. The game tried to soften him up for me by adding a mission prompt that instructed me to set loose a horde of ghuls inside the orc's stronghold to help take him down. But even with that assist, I died four times before I bested the guy. Much like the original game, the nemesis system has been my favorite part of Lord of the Hunt so far. Giving Shadow of Mordor's memorable enemies more powerful tools to use against you makes them more formidable opponents, and thus more interesting ones. I still want to poke around inside the new DLC some more to see if it has more to offer, and to see if the nemesis system works as well in this new, smaller framework. But I'm happy to say that I enjoyed the beginning of my time with Lord of the Hunt immensely. And I'm pretty sure other Shadow of Mordor fans will, too. Lord of the Hunt is available for $9.99, or free with the season pass, which is $24.99. I'll have full impressions on the DLC tomorrow morning.